I have been experimenting with new materials to see what affects I can achieve. Besides that, its just fun!! I had a watercolor I had painted a few years ago of my dog that just didn’t quite make it. One of those failed paintings . Everybody has those, right? The “before” photo is pictured below. New Products I Tried-and Loved! 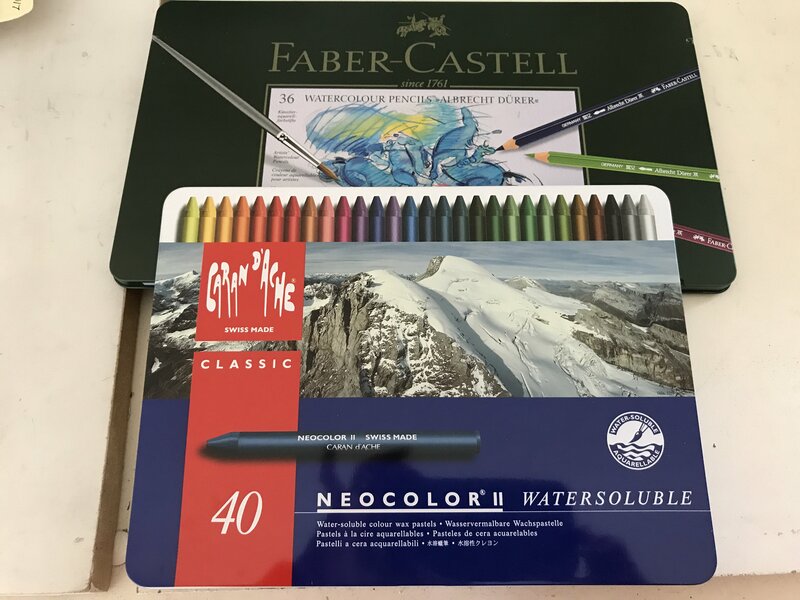 To get started, I purchased some Faber-Castell Albrecht Durer Watercolor pencils and some Neocolor 2 Watersoluble Pastels. I also had my Derwent Pastel Pencils. Sooo I began to experiment. The Neocolors are like crayons- you scribble them on and then wet them and they dissolve!! The great thing about them is that they stay brilliant when dry!! Sooo I really like these new products and I think they have promise for creating new art in the future. First, I used a wet brush to make her eyes bigger by wiping out the previously applied watercolor. After the paper dried , I used the tip of my watercolor brush to wet the top of the Neocolor and then applied the color to the eyes. It worked very well. The wet brush liquefied the color on the tip making it like paint! Then I used the black the same way to darken around her eyes. I used the pencils in the ears and on the floor to define lines. I also use the pencils on the paws. There is also some in the back corner on the right above the dog. After coloring with the pencils, I used a water brush by Faber-Castell to wet and blend the color. I really liked the brush. It has its own reservoir and that kept the brush tip constantly wet. I used the Neocolors to scribble in the fur with black and I also used blue and navy. Then using the wet brush, I blended the colors together. After all those layers dried well. I used my pastel pencils to add the white fur and also some burnt sienna to the fur. For the fur on the back that is not as bright I used a grey. The painting was done on 140# Cold press Arches. I really liked the effect but would love to try it on a hot press paper that is smoother. Below is the “after” photo of my art. Let me know your thoughts on this process and if you would like to learn more. I would love to make another and experiment a little more. let me know if you would be interested! This entry was posted in Art Lesson, Tips and Techniques and tagged Husky dogs, Neocolors 2, pastels, wolves on October 17, 2018 by Kay Witt.